Reduced investment coupled with low operating and maintenance costs provide for the basis for the manually controlled SegoPick storage and retrieval system. The manual stacker crane is simple to operate with a wide variety of load carrying attachments and cabin options. 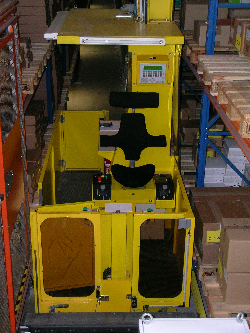 As an alternative to order picking trucks the SegoPick can be installed with lift heights up to 80 feet. The large spacious cabins are ideal for temporary storage shelving and picking carts. Options include semi-automatic route optimization, positioning aids and state of the art data links Professional Materials Handling can assist you with comprehensive consultation to find the optimum storage / retrieval solution for your company.